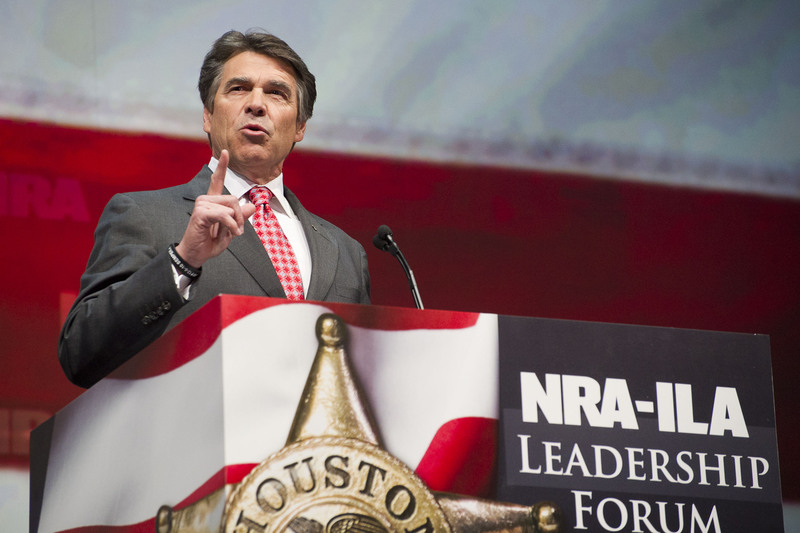 Rick Perry woos gun manufacturers in N.Y., Conn. Following the passage of some of the nation's strictest gun control laws in Connecticut and New York, Gov. Rick Perry, R-Texas, is headed to those northeastern states to woo gun manufacturers, as well as companies in the pharmaceutical and financial industries, to his southern state. It's not unusual for state leaders to try to lure businesses into their borders, but Perry is doing it with fanfare. Ahead of the governor's four-day trip, which starts Sunday, the public-private entity TexasOne is launching a $1 million ad campaign in New York and Connecticut markets, boasting of Texas' "plentiful" opportunities and "fair" regulations. Texas was one of the fastest-growing states last year, has no state income tax and has relatively loose regulations. New York and Connecticut, meanwhile, passed strict gun control laws in the wake of the the mass shooting in Newtown, Conn. Some gun manufacturers have expressed concern about the laws; the owner and president of Connecticut company Stag Arms said he was concerned about "staying in a state that does not support us." Texas isn't the only state that sees an opportunity to steal business from the northeast. South Carolina state representative Alan Clemmons was in Connecticut a couple of weeks ago. "The nation has heard from your gun manufacturers and we saw the opportunity, we know what we have in South Carolina," Clemmons said, according to the Hartford Courant. "We know it to be a great place to do business, and we know how we feel about the Second Amendment." Perry, meanwhile, has made a splash in other competing states. Earlier this year, he was embroiled in a war of words with Gov. Jerry Brown, D-Calif., after trying to steal business from California. While states continue to take up gun control on their own, the issue has completely stalled at the national level. The parents of Newtown victims, however, are still lobbying Congress and will be back in Washington this week advocating for action. House Speaker John Boehner, R-Ohio, and House Majority Leader Eric Cantor, R-Va., will meet with the Newtown families on Thursday morning. Later Thursday, the families will hold a press conference that House Minority Leader Nancy Pelosi, D-Calif., will attend.